A modern European metropolis with stunning cultural wealth. Incredible coastline with endless, majestic beaches. Mountain forests of extraordinary natural beauty. Plains with famous vineyards and visitable wineries. Lush green, aristocratic suburbs and a port city that is Greece itself on a miniature scale. Gorgeous picturesque and cosmopolitan islands, a stone’s throw away from the city. Rich gastronomic scene, endless shopping, exciting nightlife and alternative tourism experiences for each and every traveller, any time of year. This is Attica! A blessed and hospitable place for all! Captivating ancient and modern culture, fascinating museums and festivals! The whole of Attica is an open-air museum: here, monuments of worldwide cultural heritage co-exist with modern cultural centres, and world-famous archaeological sites stand side-by-side with stunning contemporary Art museums. Festivals featuring ancient Greek drama, as well as modern music and dance performances are organized all year, spellbinding the audience. Everywhere in Attica, in Athens and its nearby islands, you will have the unique opportunity to combine the most memorable sightseeing with excursions and day trips to places of stunning natural beauty. Unrivalled cultural routes that will be engraved on your memory forever. Along the cosmopolitan “Attica Riviera”, the South coastline that spreads from Faliro to Sounion, you will swim and enjoy a multitude of water sports at beaches with crystal clear waters and golden sand, that have been awarded with the blue flag distinction. You will stay in luxury resorts that provide the ultimate comfort and indulgence, you will relax and savour your food and drinks in elegant restaurants and bars by the sea. At the modern marina facilities along Attica’s coastline you will safely moor your boat, while you may also rent any type of yacht or sailboat you like and set sail for a wonderful cruise along the coast or to the Saronic islands. Beaches on the East coast of Attica are the ultimate summer getaway, refreshing and relaxing, only a hair’s breadth away from Athens. Pebbled or sandy, with shallow or deep waters, with trees or rocks, organized or secluded, family friendly or ideal for young couples and groups of friends, in these heavens by the sea of Attica you will enjoy the crystal blue sea, a multitude of accommodation options and delicious food, and you will feel as if you were on a Greek island. Experience the ultimate freedom in your summer vacation, island hopping in the awarded jewel-like islands of Attica. A stone’s throw from the port of Piraeus, dotting the Saronic sea, lie the authentically beautiful island of Aegina, paradise-like Agistri, peaceful and picturesque Poros, cosmopolitan Spetses and majestic Hydra, a preserved Greek national monument. Easily accessed by plane from Athens, the island of Kythira will thrill you with its elegance, its unique architecture, its beautiful nature and pristine beaches, while in Antikythira you will experience the most relaxing moments, enjoying the peace and quiet, the authenticity of the island and its breathtaking natural beauty. These little heavens of Attica boast the most incredible seaside landscapes, historic monuments, beautiful architecture, rich culinary scene and unique hospitality. Memorable gastronomic experiences and wine varieties that taste like the sun and sea of Attica! The multidimensional culinary scene of Attica, with its vast selection of good food, will satisfy even the most sophisticated taste palates. Everywhere you go in Attica, you will savour unique flavours and dishes made with creativity, love and the purest ingredients that the Attica land has to offer: from Greek meze tavernas, seafood & ouzo places and traditional Greek cuisine restaurants to beer houses, wine bars and all day café-restaurants. You will be utterly impressed by the Michelin-awarded gourmet restaurants, some of which are found at Attica hotels, with their creative cuisine and the renowned chefs. International cuisine, quality street food and vegetarian and vegan restaurants are to be found everywhere in Attica, satisfying all culinary preferences. In Piraeus you will enjoy delicious seafood accompanied by stunning sea views in Piraiki and around Hatzikyriakio area, creative cuisine in Kastela, fresh fish and excellent wine at the fish restaurants in island-like Mikrolimano. In the Saronic islands you will savour fresh fish and seafood right from the day’s catch, with ouzo and delicious wine by the sea, as well as local sweet temptations of unique quality and flavour. An extraordinary experience awaits you at the many visitable wineries in Attica, where you will be introduced to the tradition of the famous Attica vineyard and taste some of the most delicious local wine labels, starring the refreshing and aromatic Savatiano variety. Combine a day trip in Attica with a visit and tour at a winery, enjoy the wine makers’ hospitality and try the Savatiano and the other delicious wine varieties of this blessed land, where the sacred plant of Bacchus grew. Unlimited shopping and never-ending entertainment! Shopping lovers will be absolutely thrilled with the countless options offered in Athens, the suburbs and the nearby islands. From top quality products of the Attica land, Greek folk art items, antiques and handmade accessories to well-known chain stores, famous brands and Greek and foreign designer jewellery, here you will find literally everything! At the open-air markets and bazaars you will be impressed by the intoxicating aromas and beautiful colours, at the malls you will do your shopping with comfort and style, at the galleries and the museums you will find unique works of Art and elegant souvenirs, while in the islands of Attica the extraordinary shopping experience goes hand-in-hand with the pleasure of walking in the picturesque narrow streets of the towns. After shopping, relax in one of the numerous cafés in Attica, have a drink in a bar or roof top with stunning views, watch your favourite movie under the stars in an open-air cinema, enjoy a music, theatre, opera, classical or modern dance performance or experience the ultimate night entertainment, dancing the night away at a night club in Attica. Options are countless, all around the year, for all preferences. The alternative travellers’ paradise, the most hospitable place for all! 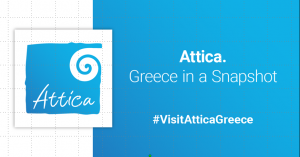 No matter what “unforgettable travel experience” means to you, no matter what you look for in an all year round short break destination, one thing is certain: you will find it in Attica! Nature lovers, hikers and mountain bikers will be amazed by the breathtaking landscapes in Attica, where rocky hills alternate with lush green forests and fascinating paths. Thermal springs with therapeutic waters, monasteries and churches that are architectural monuments of stunning beauty and religious pilgrimage importance, traditional villages and towns that have preserved their authenticity throughout the centuries, athletic events of worldwide magnitude, rooted in Greek history and promoting human values. For the wedding of your dreams or a short break with luxury and indulgence, for multigenerational holidays or for couples and friends, for the elderly or LGBT travellers, Attica offers the most memorable and unique experiences, the warmest hospitality and the most wonderful surprises!